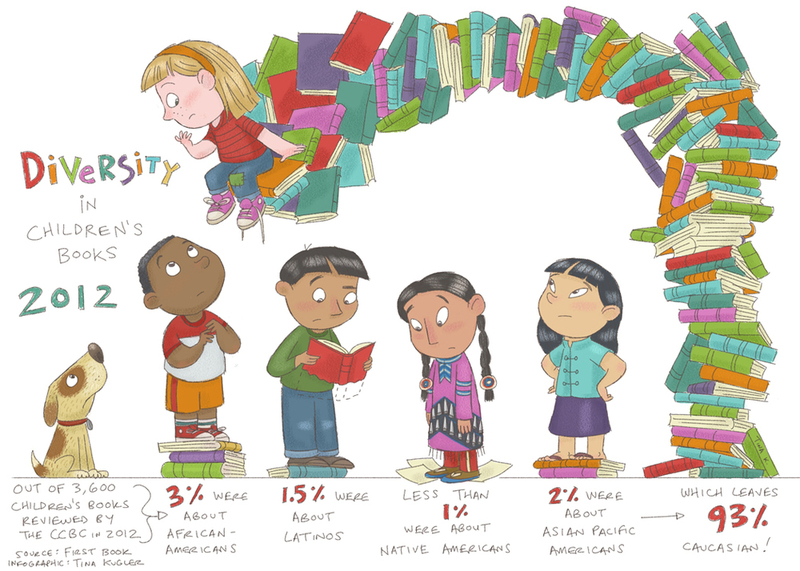 As an Arab storyteller, I’m always on the lookout for books written about and for Arab kids to use while I’m at work.Unfortunately, the lack of diversity in children’s books is overwhelming and books about/for Arab children aren’t even enough to make a statistic chart. Back in 2010, I compiled a List of Children’s Books about/for Arab Children. Since then I’ve branched off part of this list for dictionaries, folktales, and books with strong Arab protagonist. I hope to be working on a list for Muslim children books next. Now that the original list is almost five years old, I thought it might be time to update it with a few new additions and links, plus take out books I’ve placed on other lists.Please feel free to email me at ACraftyArab at gmail if you find errors or would like to make suggestions. Abdel-Fattah, Randa. Ten things I hate about me. New York: Orchard Books, 2009. Abdel-Fattah, Randa. Where the streets had a name. New York: Scholastic Press, 2010. Abouraya, Karen Leggett. Hands Around the Library: Protecting Egypt’s Treasured Books. New York: Dial Books, 2012. Addasi, Maha. Time to Pray. Jackson, Tennessee: Boyds Mills Press, 2010. Aoneh, Roula. My Alif-Yaa Book (K-1). California: Thaqafa Publishing, 2015. Aoneh, Roula. My Alif-Yaa Book (Pre-K). California: Thaqafa Publishing, 2015. Azzoubi, Rana. Million Star Hotel. Charleston, SC: BookSurge Publishing, 2009. Azzoubi, Rana. Through a Mud Wall. Charleston, SC: BookSurge Publishing, 2007. Bahous, Sally. Sitti and the cats: A tale of friendship. Boulder, CO: Roberts Rinehart Publishers, 1997. Baker, Jeannie. Mirror. Somerville, MA: Candlewick, 2010. Barakat, Ibtisam. Tasting the Sky: A Palestinian Childhood. New York: Farrar, Straus and Giroux, 2007. Blanchard, Anne. Arab Science and Invention in the Golden Age. New York: Enchanted Lion Books, 2009. Boueri, Marijean. Lebanon 1-2-3: A counting Book in Three Languages. Exeter, NH: Publishing Works, 2005. Boueri, Marijean. Lebanon A to Z: a Middle Eastern Mosaic. Exeter, NH: Publishing Works, 2005. Butler, Sean and Shannon. Issa and the Coin. London: Stacey International Publishers, 2007. Climo, Shirley. Egyptian Cinderella, The. New York: HarperCollins, 1992. Clinton, Cathryn. A Stone in my Hand. Cambridge, MA: Candlewick Press, 2002. Cohen, Barbara. Seven Daughters and Seven Sons. New York: HarperTeens, 1994.
da Costa, Deborah. Snow in Jerusalem. Morton Grove, IL: A. Whitman, 2001. Dennis, Yvonne Wakimand Maha Addasi. Kids Guide to Arab American History. Chicago, Illinois: Chicago Review Press, 2013. Devine, Barbara. Elvis the Camel. Northampton, MA: Crocodile Books, 2002. Durkee, Noura. Animals of Paradise, The. London, UK: Hood Hood Books, 1996. Ellis, Deborah. Children of War: Voices of Iraqi Refugees. Toronto, Canada: Groundwood Books, 2009. Ellis, Deborah. No Safe Place. Toronto, Canada: Groundwood Books, 2010. Farmer, Nancy. Clever Ali. New York: Orchard Books, 2006. Fayad, Susan Daniel. My Grandfather’s Masbaha. Bloomington, IN: AuthorHouse, 2013. Fayad, Susan Daniel. Stomp the Ground: Build a Home. Self-Publish, 2015. Geyer, Flora. Saladin: the Muslim Warrior who Defended his People. Washington, D.C.: National Geographic, 2006. Gray, Nigel. A Balloon for Grandad. New York: Orchard Books, 1988. Hamilton, Martha. Well of Truth: A Folktale from Egypt, The. Atlanta, GA: August House, 2008. Hawes, Louise. Muti’s Necklace: The Oldest Story in the World. Boston, MA: Houghton Mifflin Harcourt, 2006. Heide, Florence Perry and Judith Heide Gilliland. Day of Ahmed’s Secret. New York: Clarion, 1990. Heide, Florence Perry and Judith Heide Gilliland. Sami and the Time of Troubles. New York: Clarion, 1992. Heide, Florence Perry and Judith Heide Gilliland. House of Wisdom, The. New York: DK, 1999. Henderson, Kathy. Lugalbanda: the boy who got caught up in a war. Cambridge, MA: Candlewick Press, 2006. Henty, G.A. Cat of Bubastes: A Tale of Ancient Egypt, The. New York: Dover Publications, 2002. Hickox, Rebecca. Golden Sandal, The. New York: Holiday House, 1998. Hill, Eric. Boby Yazhab Ilal Madrasa (Spot Goes to School). New York: Interlink Pub Group, 1988. Hughes, Vi. Aziz the Storyteller. Northampton, MA: Crocodile Books, 2002. Husain, Shahrukh. Wise Fool, The. Cambridge, MA: Barefoot Book, 2011. Hussain, Asim. Khadijah goes to School. Toronto, Canada: LogixPlayer Inc. 2011. Hussain, Saima S. Arab World Thought of It, The. Canada: Annick Press, 2013. Ichikawa, Satomi. My Father’s Shop. San Diego, CA: Kane/Miller Book Pub, 2006. Johnson, Julia. A Gift of the Sands. London, UK: Stacey International Publishers, 2005. Johnson, Julia. One Humpy Grumpy Camel. London: Stacey International Publishers, 2006. Johnson, Julia. Saluki, Hound of the Bedouin. London: Stacey International Publishers, 2005. Johnson, Julia. Pearl Diver, The. London: Stacey International Publishers, 2003. Johnson-Davies, D. Goha The Wise Fool. Cairo: Hoopoe Books, 1995. Johnson-Davies, D. Stories from the Arab Past. Dokki, Cairo: Hoopoe Books, 1997. Kimmel, Eric A. Joha makes a wish: a Middle Eastern tale. New York: Marshall Cavendish, 2010. Knight, Margy Burns Africa is Not a Country. Brookfield, CT: Millbrook Press, 2002. Krebs, Laurie. We’re Sailing Down the Nile. Cambridge, MA: Barefoot Books, 2007. Laird, Elizabeth. A little piece of ground. Chicago, IL: Haymarket Books, 2006. Letts, Elizabeth Alalou. Butter Man, The. Watertown, MA: Charlesbridge, 2008. Lewin, Ted. Storytellers, The. New York: Lothrop, Lee and Shepard, 1998. MacDonald, Margaret Read. How many donkeys? Morton Grove, IL: Albert Whitman and Co., 2009. MacDonald, Margaret Read. Tunjur Tunjur Tunjur: A Palestinian Folktale. Cavendish, Marshall Co., 2006. Makhoul, Reem. The Girl Who Lost Her Imagination. New York: Ossass-Stories, 2015. Marston, Elsa. Olive Tree, The. Bloomington, Indiana: Wisdom Tales Press, 2014. Matze, Claire Sidhom. Stars in My Geddoh’s Sky, The. Park Ridge, IL: Albert Whitman & Company, 2002. McGraw, Eloise Jarvis. Golden Goblet, The. New York: Puffin Books, 1986. McGraw, Eloise Jarvis. Mara, Daughter of the Nile. New York: Puffin Books, 1985. Mobin-Uddin, Asma. My Name is Bilal. Honesdale, PA: Boyds Mills Press, 2005. Morris, Ann. Grandma Hekmatt Remembers: an Arab-American family Story. Brookfield, CT: Millbrook Press, 2003. Munshey, Sana. We’re Off To Make ‘Umrah. Leicestershire, UK: Islamic Foundation, 2010. Nagda, Ann W. Dear Whiskers. New York: Holiday House, 2000. Nicki, Peter. Crocodile, Crocodile. Northampton, MA: Crocodile Books, 1976. Nimr, Sonia. Ghaddar the Ghoul and Other Palestinian Stories. London: Frances Lincoln Children’s Books, 2008. Nye, Naomi Shihab. A Maze Me: Poems for Girls. New York: Greenwillow Books, 2014. Nye, Naomi Shihab. Honeybee: Poems and Short Prose. New York: Greenwillow Books, 2008. Nye, Naomi Shihab. Turtle of Oman: A Novel, The. New York: Greenwillow Books, 2014. Nye, Naomi Shihab. Habibi. New York: Simon Pulse, 1999. Oppenheim, Shulamith. The Hundredth Name. Honesdale, PA: Boyd’s Mill, 1995. Osborne, Mary Pope. Season of the Sandstorms. New York: Random House, 2005. Raatma, Lucia. Queen Noor: American-born queen of Jordan. Minneapolis, MN: Compass Point Books, 2006. Rosenberg, Liz. Silence in the Mountains, The. Chicago, IL: Orchard Books, 1999. Rumford, James. Traveling Man: The Journey of Ibn Battuta. Boston: Houghton Mifflin, 2001. Sales, Francesc d’A. Ibrahim. New York: Lippincott, 1989. Salim, Dana. Dreamland with Mommy. China: Self published, 2015. Shalaby, Alaa. Geemo and the Missing Egg. Mckeesport, PA: ShalabyMedia, 2008. Sharafeddine, Fatima. Servant, The.Toronto, ON: Groundwood Books, 2013. Sharafeddine, Fatima. Amazing Travels of Ibn Battuta, The. Toronto, ON: Groundwood Books, 2014. Shefelman, Janice. A Peddler’s Dream. Austin, TX: Houghton Mifflin, 1992. Sheffield, Marilyn. Fizza the Flamingo. Northampton, MA: Crocodile Books, 2003. Shulevitz, Uri. The Travels of Benjamin of Tudela. New York: Farrar, Straus and Giroux, 2005. Simpson, Juwairiah J. L. A Wicked Wazir. Plainfield, IN: American Trust Publications, 1990. Simpson, Juwairiah J. L. The Four Daughters of Yusuf the Dairy Farmer. Plainfield, IN: American Trust Publications, 1984. Simpson, Juwairiah J. L. The Jinn in the Clock. Plainfield, IN: American Trust Publications, 1990. Simpson, Juwairiah J. L. The Princess Who Wanted to Be Poor. Plainfield, IN: American Trust Publications, 1987. Smith, Chris. One City, Two Brothers. Cambridge, MA: Barefoot Books, 2007. Spalding, Elizabeth and Sarah. Dahman: The Mystery of the Champion Arabian Horse. Saudi Arabia: Al Mutawa Press, 2006. Stamaty, Mark Alan. Alia’s mission: saving the books of Iraq. New York: Alfred A. Knopf, 2004. Stanley, Diane. Saladin: Noble prince of Islam. New York: HarperCollins, 2002. Stolz, Joelle. Shadows of Ghadames, The. New York. Delacorte Press, 2004. Dee S Tóth-Jones, Dee S. Street Cats of Marrakech, The. West Bengal, India: Chiaroscuro Books, 2013. Whelan, Gloria. Parade of Shadows. New York: HarperCollins, 2007. Wildsmith, Brian. Animals to Count. Long Island City, NY: Star Bright Books, 2009. Wilkes, Sybella. Out of Iraq. London, UK: Evans Brothers Limited, 2010.